We’ve finally got away on our delayed honeymoon and rediscovered sunshine, heat and relaxation. A nine hour flight from Gatwick on Sunday evening saw us arrive at Male airport on the first 767 Dreamliner to ever land there. This led to the strange sensation of stepping out into heat and the flashes of cameras as if we were some form of celebrities. Everyone we spoke to at the airport asked about the plane and the flight, and seemed genuinely proud that they had been chosen to receive this inaugural flight. Immigration and customs were quickly passed, our visas stamped and luggage swiftly delivered, and then we met our rep. With a honeymoon congratulations card snuck into the paperwork and glittery stars stuck in a spray beneath our names, we began to get an inkling of the attention to small detail we were going to continue enjoying. A quick and efficient transfer by bus later and we were waiting for our sea plane to the Hakuraa Huraa resort. This was the bit I’d been quietly worrying about, and after a bit of shuffling of people.and luggage around to balance the plane, we were on our way. The journey took about forty minutes. Forty hot and noisy minutes, and I was really flagging by the time we touched down. It wasn’t as scary as my imagination had built it up to be, and certainly after some of the more extreme rollercoasters I’ve been on this year the acceleration, climb, maneuvers and descent were very mild. Truth be told, it was gentle and smooth. You just wouldn’t believe how hot and noisy it was though. We were met by our concierge, Lynn, who immediately brought everyone to the air conditioned waiting room at the jetty’s end, and supplied ice-cool flannels before beginning the walk along what we were assured was the longest jetty in the Maldives. 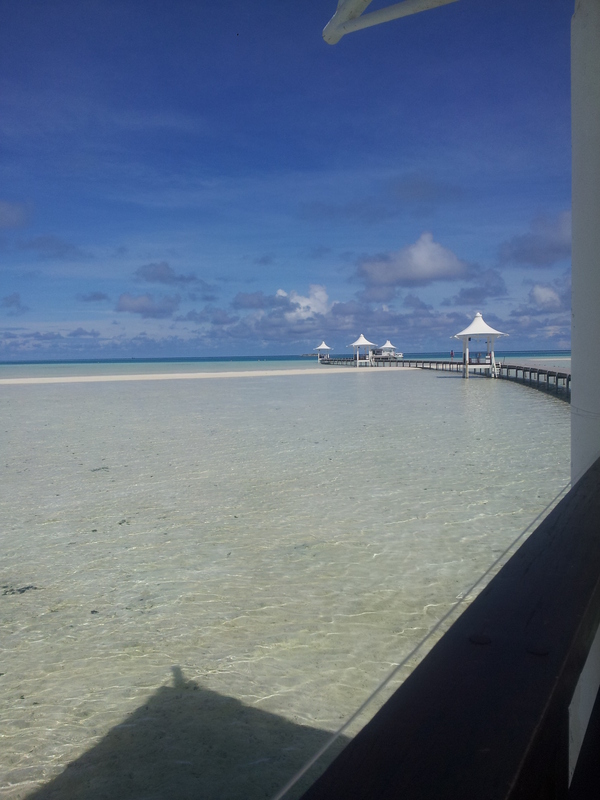 This entry was posted in holiday, honeymoon, travel and tagged Holiday, Honeymoon, maldives, travel. Bookmark the permalink.